A chainsaw is one of the most powerful and dangerous tools you can own. You must choose wisely and safely if you are committed to purchasing a chainsaw. Why would you buy one? Well, they are great for chopping firewood, clearing areas and also chopping back branches and fallen trees that my blow over in bad weather and storms. There are plenty of makes and models out there on the market so it can be tough deciding which is the best purchase for you. Below are our top tips for choosing a chainsaw which will perform and last. A petrol chainsaw is the most popular and for good reason. Easy to use, durable and no dangerous connections or wires. Its cordless feature is its biggest advantage as it can be carried and used anywhere, so long as the fuel tank is full. Also called a petrol chainsaw, it features a two-stroke engine and uses a mix of oil and petrol as its powering fuel. A petrol-powered saw also rates high in terms of performance. Its high power output makes it suitable for heavy duty work. A cordless petrol chainsaw is great for mobility and accurateness when reaching to difficult areas or around large tree trunks and branches. However, it is not without disadvantages. The first is the loud grating sound it makes as it razes trees and structures. The second is the maintenance aspect. It requires regular maintenance which involves servicing the engine, keeping the tank full and sharpening the blades. As the name suggests, the chainsaw model is powered by an electric motor. It has an attached power cable that plugs into the mains. The electric models are lighter than the petrol and battery-powered counterparts. Thus, they are easier to handle and maneuver. An electric chainsaw is best suited to cutting jobs that demand less power. This includes light cutting around the yard, pruning and trimming. This type is also quiet in its operation and requires less maintenance. Portability is a main drawback of the electric powered model, It requires an electric outlet into which it can be plugged. An extension cord or a portable electric generator can solve the problem to a certain extent. This is the cordless variant of an electric chainsaw. It makes up for the deficiencies present in its electric and petrol-powered counterparts. Although it makes use of an electric current, it does not need an electric outlet at hand. Its source of power is a rechargeable battery. Also, it does away with the messiness characteristic to the petrol-powered model caused by the petrol-oil blend. It is also lighter than the two. It can be used for light cutting and trimming work. As far as the disadvantages are concerned, it will require frequent charging sessions. It will last only so long as the charge lasts. Multiple batteries can help extend its use. Battery-powered models tend to pricier than other models. The Aussie weather can be harsh. Extreme temperatures of heat, dust that gets everywhere or stormy, wet days. Whatever the weather conditions if you choose a durable, heavy duty make and model of chainsaw you will have peace of mind and great, long lasting performance. Check the weight of your chainsaw before you buy it. Some can be extremely heavy which will make for an uncomfortable experience and handling when using the chainsaw. Safety should really be at the top of this list. 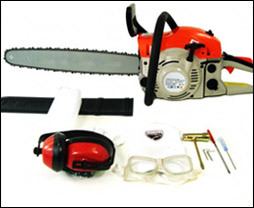 Look for a chainsaw that comes with everything you need to be fully protected. Gloves, Goggles, Ear Muffs and an all important bar cover. There are no second chances with a chainsaw so make sure you have all the safety equipment you need before you start. Hopefully, these tips will help you make the right choice in purchasing a great chainsaw. Look online where you can access some great brand names at heavily discounted prices. 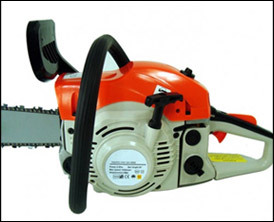 These days, there is a diverse range of chainsaw models of various reputed brands in the market. You need to systematically analyze your needs prior to choosing the perfect chainsaw for your use. What kind of work you intend to accomplish with the help of Chainsaw equipment? What magnitude of stuff is expected to be cut on a regular basis? The chainsaw power and guide bar length that you would require can be decided by the above two crucial questions. The capacity in cubic centimeters is the best indication of the power of the chainsaw. Availability of service and spare parts, ease of maintenance, design features and balance of the chainsaw must also be given due thought. Heavy 4.5 kW to 6.5 kW 80cc to 125cc 50cm to 65cm and longer Timber falling, Sawlog preparation, Chainsaw milling. Medium 3.0 kW to4.5 kW 50cc to 80cc To 50cm Small tree falling, trimming and Cross cutting. Light To 3.0 kW To 50cc To 40cm Pruning.